I am so excited! This is the first day of my freelance writing career, and we are featured on HuffingtonPost Home. I’ll take that as a great big (((YES))) from the great beyond. Thanks to Amy Marturana for the fun interview! 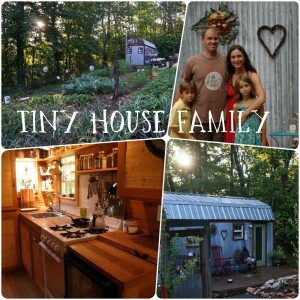 Read her article and tour our tiny house. These are the power lines at the top of the hill where we live. I don’t love that we have massive power lines nearby, and am thankful to the trees for hiding them from our view, but standing up there last night, I felt gratitude for them. I squinted to see them as they climbed up and down these Blue Ridge Mountains bringing power to all sorts of endeavors. As I soaked in the beauty of the amazing fall sunset, I heard our friend Tracy’s unexpected words, “Wow those power lines are beautiful. It’s amazing what humans have accomplished.” Her words helped me to appreciate the power lines. As the sun sunk behind the mountains and the power above me crackled on it’s way to somewhere else, I visualized myself plugged into it. Yesterday, was my last day at my day job. I quit my job to be a writer. I’ve been afraid to take this leap for a long time for many reasons, one of the biggest: my fear of not having enough. This tiny life has shown me how little we need, how much we have, and how simplifying and “cultivating contentment” brings happiness. 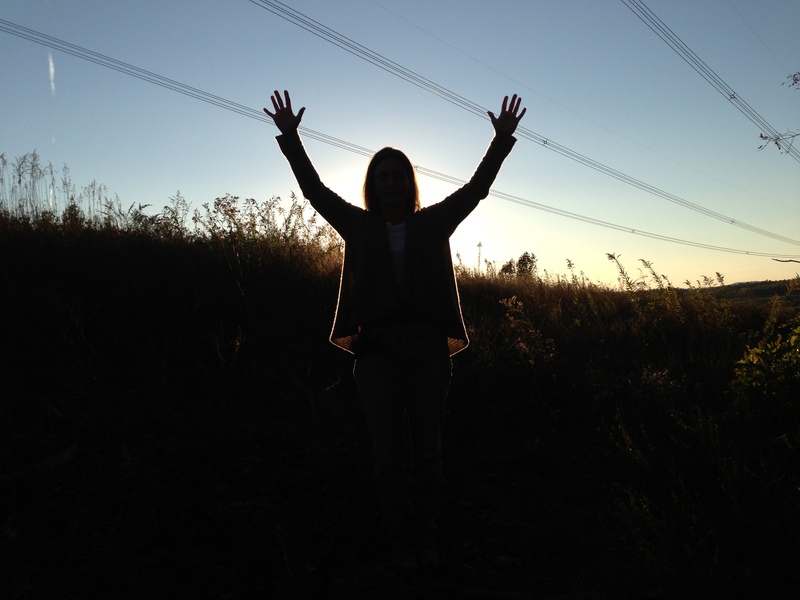 I am grateful and very excited to have the opportunity to follow my bliss and plug into my power! 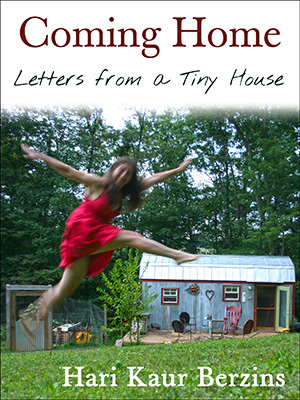 This is a link to a fair companies video of my blogging friend Debra and her tiny house remodel. I love her line “cultivating contentment.” We can so cultivate contentment, and it feels so good. This morning, I wrote a list of intentions in my journal and hung them in my office corner. I intend to read them daily. This freedom is going to take a lot of discipline! I’ve got the power to. . .
You’ve got the power! What are your intentions? Write them down. Share them in the comment section. Post them where you’ll see them. Go for it! Thanks so much for visiting! Be well. Oh WOW Hari I am so excited and happy for you and super duper proud that you’ve had the courage to do something that you’d been putting off through fear of the unknown. Your intentions are brilliant and I think mine are all the same! Freedom does require discipline, but I find trying to make some sort of a routine (to get things done, not to be strict or to limit yourself) helps. I have a way to go til I am optimised in my own organisation, but life is one big learning curve. I can’t wait to read your eBooks and more of your writing. CONGRATULATIONS! Thank you for inspiring us all! So nice to see you here! Thank you for your sweet comment. It is so exciting looking at everything as one big possibility. It helps that it’s been a most glorious 70 degree day in the Blue Ridge Mountains all the while knowing that the temperature will drop 10 degrees each day until Tuesday when snow is forecasted! I love savoring these moments. I look forward to following your journey, as we wade these waters together! I look forward to reading more of your writing, too!! I appreciate and I am inspired by your BIG tiny life! One of my greatest teachers, Gabrielle Roth, died this past Monday. One of her challenges: “Do you have the discipline to be a free spirit?” … Hari, you are living this vibrant dancing path and I honor you! Thank you! I followed your posts as she was passing. What a glorious life she lived! She inspired me through you. You’ve always inspired me 🙂 so glad to call you my friend. Thank you for sharing Gabrielle’s challenge; it does take discipline when there are no imposed schedules. Here’s to following through with intention! Well, it’s been an encouragement that via the internet, we can all share our lifestyle and help figure out ways of accomplishing our goals. Even though we are part timers at our small house, due to husband’s military service (so we still maintain the townhouse near work since he’s on call). Our small house at the homestead is fairly similar to yours (shed cabin that we reconfigured) and our children are similar in age (also boy/girl), so I’ve really enjoyed keeping up with your updates! 🙂 There’s some photos on my blogpage, if your family wants to check out how we’ve configured for part time use. We were pretty much there for a month straight, after husband returned from deployment early Summer. Happy Sunday! You’ve ALWAYS had the power! Exciting times for the Berzin family! Love ya! OM this story really inspires me! Ya see last year i quit my job (that i was very miserable doing) and jumped into something i have always wanted to do! Kenzee’s Korner Rockin Resale (named after my amazing 2 year old grandaughter) Its mostly for children! I love finding gently used stuff for people and being able to reuse, recycle, and resale! Of course its been rough because i went from over $100,000 a year to no paycheck at all! lol! but i have learned alot and made plenty of mistakes! But i live a very simple life and i love it! Glad i stumbled on to your story because it gives me so many more ideas to live a simple almost stressfree life! lol! Thanks for sharing and ill definatley put you in my favorites! HI Susie! Good for you for taking the leap!! I bet it gives you a good feeling to reuse and recycle! I try to keep my shopping at stores like yours. I’m even working on some upcycled rugs to sell in a local salvage store in my community. Woohoo!! Dear Hari, I long for the peace and contentment which defines you. My husband saw your house online and brought it to my attention. We don’t quite qualify for your definition of tiny, but feel your similar need. In the past 5 years we have gone from a family of 6 in a 5000 square foot home, to a family of 4 in a 3400 ft home to now just me, full time, and my husband when he can get home from his job 2000 miles away, in a 1343 sq. ft home. I gave most of my furniture to my oldest daughter who has a new,good sized house. I t was difficult to part with many family heirlooms which had been handed down for generations, but at least they are still in the family. Thanks for reading and for sharing your story. You have certainly downsized A LOT in the last 5 years. I like “reorganize my mind set, not my closet.” It’s so true. Good for you! Thanks for the well wishes. I hope you are safe too! I admire your courage in going tiny and following your dream to be a writer. Congrats! One day I hope to follow in your footsteps. Downsize, minimize and live more simply! I have too much house and too many things. It feels like a heavy weight. I work and work to keep these things I don’t want. It is crazy. I tell my mom that I feel like I am on a human gerbil wheel – running as fast as I can and getting nowhere! I will look forward to your writings as hope for my future and energy for my soul! Thanks for your concern. We have wonderful neighbors and are very close to town. Rural, but not remote. Did you notice our giant dog 🙂 ? She’s quite the working guard dog. Happy here. Good luck to you as you decide what’s next. Be well! YES! I am so happy for you! It is a wonderful feeling, you are FREE! Way to go. Whenever I start doubting myself (which is hardly ever, anymore 🙂 I head over to see you. I LOVE your story, thank you for sharing it. I want to move to Africa for a few years. This is our goal. We want our son to know the rest of the world. We want him to be appreciative, and understanding. If we NEVER go, I still am the happiest person – maybe with the exception of YOU 🙂 and I do not need anything more. Life is so good. You are so cute. I’d love to do a radio story with you. That sounds super-fun! Living in Africa with your son sounds amazing. I bet you do it! Thought of you, because we are going to do a tiny house remodel. I love how quick and easy a remodel can be. We realized that the corner where we had the desktop computer is not functioning well, so we are going to get rid of the desk and add more couch. It might take an afternoon! Sweet life, no? Congratulations! You have a dream and are chasing it with the love and support of your family and friends. Remember it is “dream, struggle, victory”. I salute you for having the guts to go after your dreams and inspiring others along the way. Onward and Upward! Blessings on you and your family.